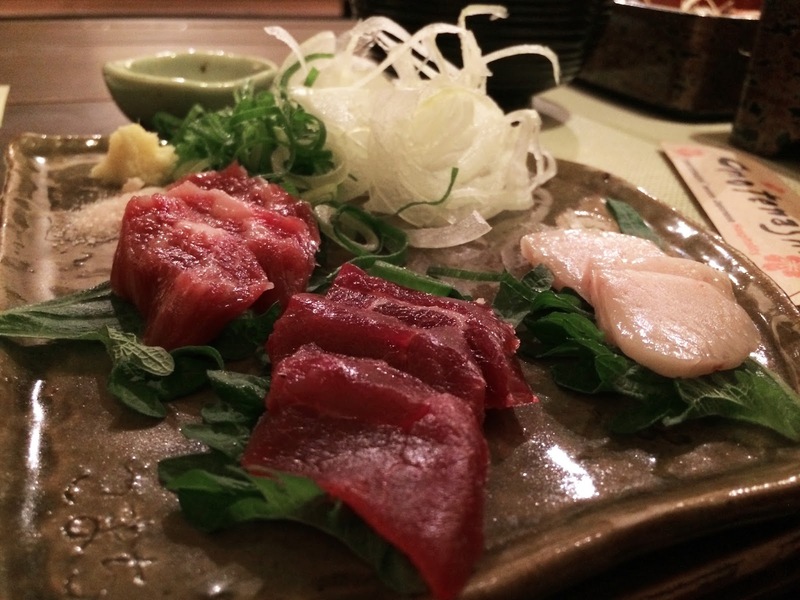 JAPAN 2015: Day 5 - Arashiyama and HORSE SASHIMI? Kyoto is surrounded by nature, especially when compared to Tokyo or Osaka. You will often see mountains from a distance. 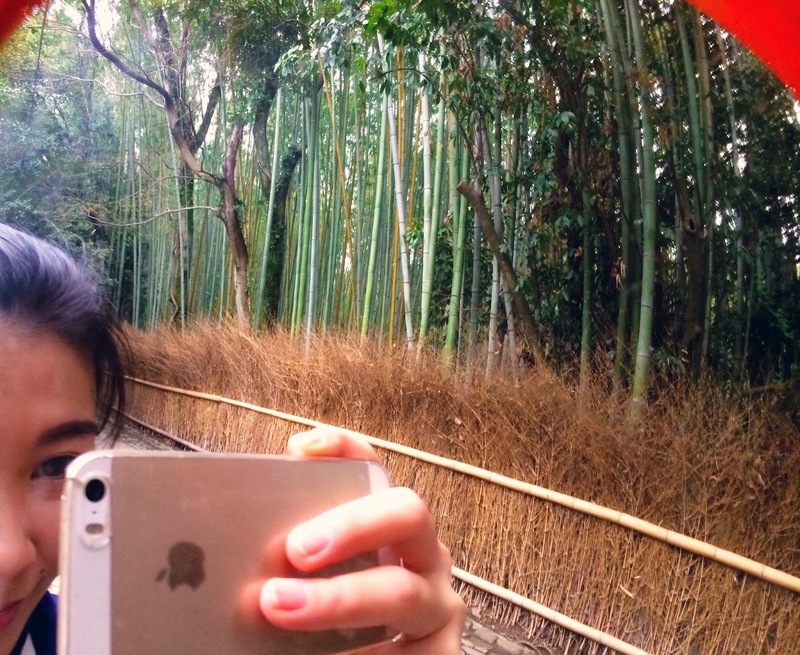 Today we'll be going to one of the most nature-y attraction in Kyoto - Arashiyama. You'll usually need about half day to cover the main attractions in Arashiyama, and a full day to cover more of this end western part of Kyoto. April 11th, 2PM - Arashiyama (嵐山), Kyoto. Technically, "Arashiyama" is referring to just the mountains south of the river but is now commonly used to refer to the entire touristy district. The mountains surrounding this district can be seen clearly, you can even spot several blossoming Sakura trees there. I imagine the mountains look even better in autumn with gold and rust foliage. Still surrounded by mountain backdrop, this was on the way to Tenryu-ji, the most famous temple in the area. The entrance of Tenryu-ji. There and then, I decided to not go in because I had a little more than enough of temples during the first half of the day. The walk wasn't wasted though, managed to catch this view on the way out. This area wasn't open to public, so all the fallen petals remained undisturbed. Beautiful! Another soft serve break before deciding where to go next. This is soy-flavored, yum! 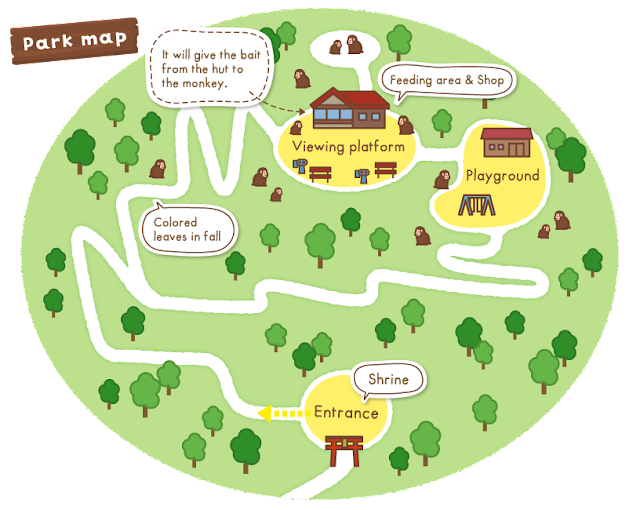 It was then decided that the Monkey Park Iwatayama is next. The park is located somewhere atop a mountain, could be a viewing point too. After all, it's only a "10 minutes hike to the top" according to websites and stuff. Here's an adorable looking map that shows the adorable hike up. April 11th, 3.30PM - Monkey Park Iwatayama, Arashiyama (嵐山), Kyoto. 10 MINUTES?? 10 MINUTES OF WHAT?? OF PANTING AND CRYING THAT'S WHAT. Do not underestimate this seemingly "easy and casual" hike up. It was rather strenuous (for me), and took me what felt like half an hour. So don't treat this like another la-di-da sightseeing, but be prepared for it! Wear proper shoes and clothing and you might actually make it in 10 minutes. Was it worth it? Probably. Will I visit again? Probably not. Of course you can feed monkeys at a monkey park. But only from inside of this feeding cage because that's how they train the monkeys to not misbehave around visitors everywhere else. If you're worried about the monkeys being exploited for tourism, you need not. This park is more like 2 huts built in a mountain. All the monkeys come and go at their own discretion and are 100% wild. They behave around visitors because they know that's how they get treats. A breed that's native to Japan, called the Japanese macaque aka Snow monkey. See, these guys coexist happily with the man-made environment. Here's a video of those monkeys in action. I call it "Monkey A & B fight over a branch only to have it taken away by the cunning Monkey C." Don't worry, if you're watching closely, you'll see that Monkey A & B found themselves another target at the end. A family of three cuddling together. 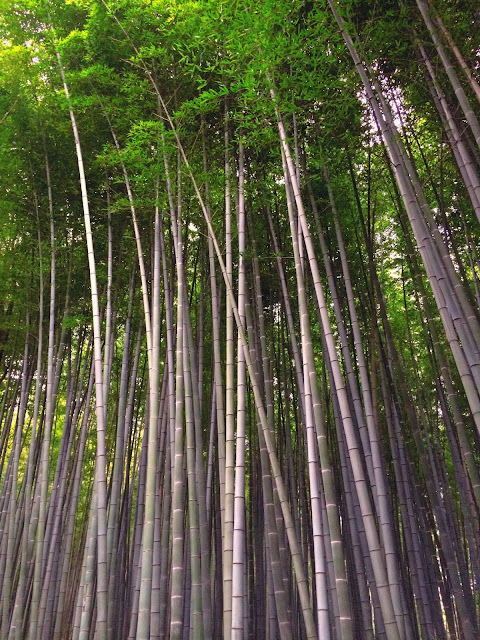 April 11th, 5PM - Bamboo Groves, Arashiyama (嵐山), Kyoto. When in Arashiyama, visit the iconic bamboo groves. I'm sure nobody needs to be told that. You can access the groves from the garden (north) exit of Tenryu-ji, so be wise when planning. As expected, there were many visitors at the grove. 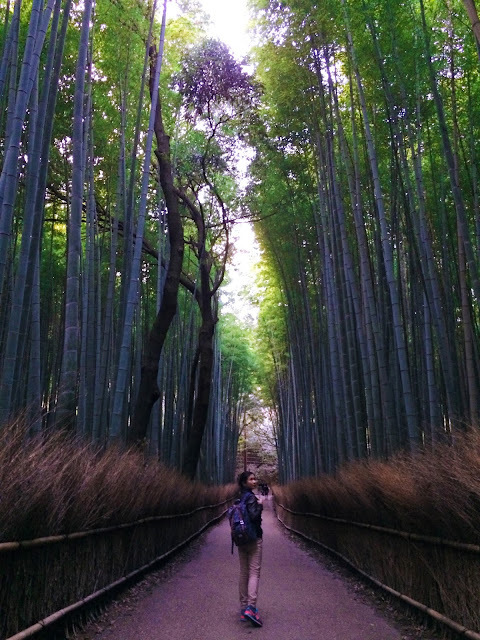 However, because the bamboo grove area is so huge (so huge that you might call it a bamboo forest), you can still find a piece of serenity somewhere. 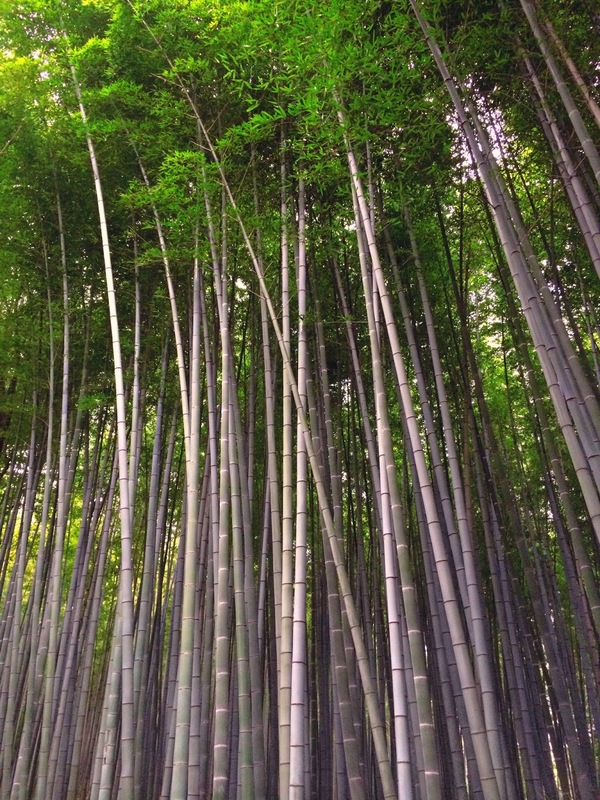 When wind passes through stalks of bamboo trees, it creates a whisper-like sound in addition to the rustles of swaying stalks. I tried to capture that in video but needless to say, nothing beats the real thing. Here's a final photo from my camera before it died. Luckily I had my trusty 5S, though the photo quality is incomparable to my Nikon's. Just bear with it until end of this post ok? Ah, the mandatory tourist shot. That wraps up my visit to Arashiyama. You know what this calls for? 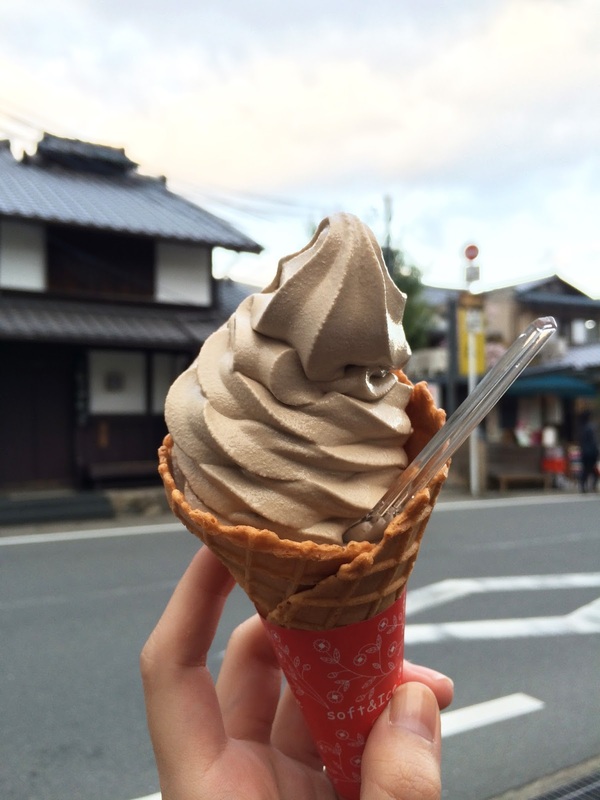 Another soft serve yaaaassss. This is hoji-cha flavored. April 11th, 8PM - Central Kyoto. Dinner was at a random restaurant, which name I don't remember, in central Kyoto. 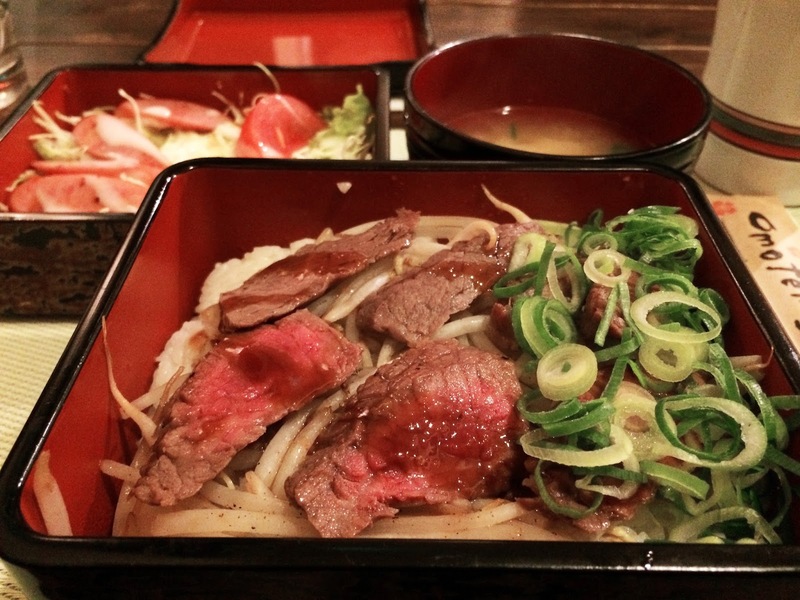 I had normal food, gyuniku (beef) over rice. I also had a taste of basashi (馬刺し), aka horse "sashimi". I didn't search for this on purpose nor have I even thought about consuming it before. However, at that moment, it was already ordered and on the table. So I gave it a go, for the sake of trying. It tasted like any other sashimi, but much chewier/tougher. I have mixed feelings about this so I didn't really take the time to savor it like how I do with other food. One try is enough!